This appeared recently in our forums, and we wanted to give it more attention. RCA theremins don't come up for sale very often (maybe once or twice a year), so when an available unit is announced, our ears definitely perk up! I am offering my RCA 1264 Theremin for sale. 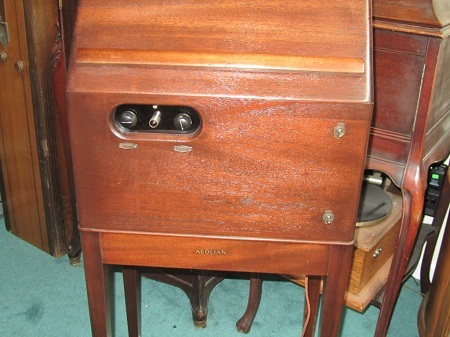 This is serial number 200047 listed in the Theremin Registry (Aerielle). I've had her since 2006 when I purchased her through a forum auction here in the Theremin World forum. After many back surgeries and a lack of any appreciable theremin talent I've decided that it's time to let her move on to her next home. Several photos of this gorgeous and rare instrument have been shared out on PhotoBucket. Visit our forums for more information. We'll be watching this one closely!